A first-half double from Karl Hawley helped Preston knock Premier League strugglers Derby out of the FA Cup. The striker sidefooted past goalkeeper Lewis Price for his first, with Simon Whaley's curling 12-yard effort doubling Preston's lead. 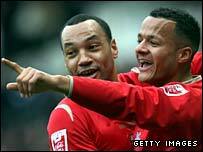 Hawley scored from outside the box for his second before Robert Earnshaw's close-range strike gave the Rams hope. But in the dying seconds Lewin Nyatanga was sent off for a foul, with Neil Mellor scoring the resulting penalty. The home fans' displeasure was made clear at the final whistle with the Derby players being greeted by a cacophony of boos as they made their way to the tunnel. But Preston's victory was well-deserved and the performance belied their lowly standing in the Championship - they are four points from safety in a league in which the Rams are likely to be plying their trade next season. Before the match, Derby had announced that the club was the subject of a takeover by an American consortium, with an announcement expected on Monday. It is believed the group will make a "reassuring" amount available for boss Paul Jewell to spend on players in the summer. But the investors will have to delve deep into their pockets on the evidence of this match, for Jewell's side looks in need of a major revamp. Jewell will have to start rebuilding from the back with the defensive errors, which have proved costly throughout the season, again on show. Preston needed just 14 minutes to take the lead through Hawley after a bad mistake by Andy Todd. His strike partner Chris Brown got the better of the defender, and 26-year-old Hawley, standing unchallenged inside the box, neatly steered Brown's byeline pass beyond Lewis Price. In the 23rd minute, Derby suffered a further blow when former Preston winger Eddie Lewis limped off injured. Matters went from bad to worse for the Rams as the visitors doubled their lead thanks to Whaley's fourth goal of the season. Again, Hawley was at the heart of the action with the striker's coruscating run causing chaos among the Derby defence. The former Carlisle striker found Darren Carter, who squared the ball to Whaley to curl a right-footed shot past the diving Price. The impressive Hawley extended Preston's lead with the forward again the benefactor of a Todd defensive error, finishing with aplomb two minutes before the break. Jewell was left with no option but to change the team at half-time and he brought on Earnshaw and Giles Barnes, with Earnshaw making an immediate impact with his first touch of the game. Earnshaw's goal gave the beleaguered Derby fans some hope and Savage should have scored from point-blank range minutes later but keeper Andy Lonergan used all his anatomy to deny the midfielder. Preston's Youl Mawene should have done better with a headed effort and soon afterwards North End came inches from claiming their fourth when Stephen Pearson headed against his own crossbar. It was substitute Mellor who eventually scored the visitors' fourth after Nyatanga illegally stopped the former Liverpool striker's surging run. The Wales international received a straight red for the professional foul and Mellor struck low into the right corner to add salt to Derby's wounds. "I'm at a loss to explain it. I see them Monday to Friday in training and they're totally different people. "They come out on a Saturday on match day and they fall apart at the first sign of adversity. "One of the reasons I came here was that hopefully there was going to be some American investment coming in. I have spoken to the investors so they know it's a tough job." "You just have to look at results in the FA Cup every year and in every round and there are shocks. I said to my players before the game that I would like us to be one of the shocks. "If you had asked me what is the most important, the FA Cup or the Championship - I would have said the Championship. "But there is no doubt that the win over Derby was very important. It's something we can feel good about, and on top of that we had the bonus of scoring a few goals." Derby: Price, Edworthy, Davis, Todd (Barnes 46), Nyatanga, Ghaly, Savage, Pearson, Lewis (Teale 24), Miller, Villa (Earnshaw 46). Subs Not Used: Hinchliffe, Leacock. Preston: Lonergan, St. Ledger, Mawene, Chilvers, Davidson (Hill 46), Sedgwick, McKenna, Carter, Whaley (Nicholls 86), Brown, Hawley (Mellor 85). Subs Not Used: Chris Neal, Ormerod. Goals: Hawley 14, Whaley 33, Hawley 45, Mellor 90 pen. BBC Sport Player Rater man of the match: Preston's Karl Hawley 9.62 (on 90 minutes).